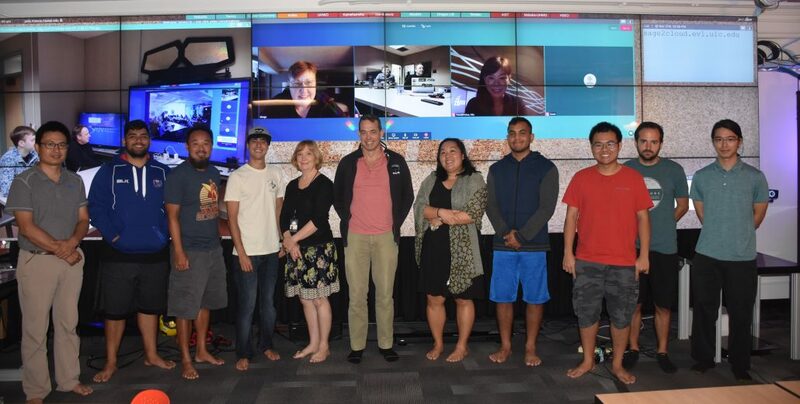 The Laboratory for Advanced Visualization & Applications (LAVA) at University of Hawaiʻi at Mānoa and one of the lead development teams for SAGE2™, hosted a CyberCANOE Club meeting on November 27. The CyberCANOE, which stands for Cyber-infrastructure enabled Collaboration Analysis Navigation and Observation Environment, are tiled display walls, and their installation and use has exploded across the islands. 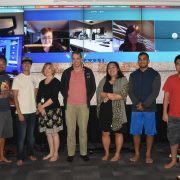 Jason Leigh, Director of LAVA and Principal investigator of the National Science Foundation-funded SAGE2 grant, invited his collaborators to attend a half-day meeting in person or via video teleconference, to begin to “talk story” (Hawaiian for “discuss”) and to share best practices and collaborate. SAGE2 lead developers from the Electronic Visualization Laboratory (EVL) at University of Illinois at Chicago also participated remotely. LAVA and EVL provided CyberCANOE Club attendees with an overview of the new features of version 3 of SAGE2, which was recently released. Attendees also got to discuss any issues they were encountering and/or share success stories. Invited sites included Chaminade University of Honolulu, Hawaii State Energy Office, Kamehameha School, University of Hawai’i at Hilo (‘Imiloa Astronomy Center of Hawai’i, Computer Science Department, Mookini Library), University of Hawaiʻi at Mānoa (LAVA, Center for Microbial Oceanography: Research and Education — C-MORE, Hawai`i Institute of Geophysics and Planetology — HIGP, Information Technology Center, Innovation Lab — i-LAB), and University of Hawaiʻi at West Oahu (Academy for Creative Media).